Season 4 of the show is wrapping up on History on April 21. 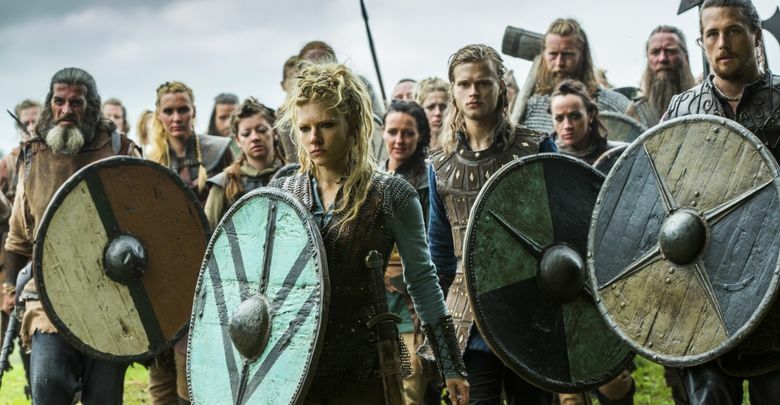 Pacific Northwest Magazine editor Bill Reader advises binge-watching the previous seasons if you plan to sail in to Season 5 with the Norse hordes. She had been right about “True Detective” (Season 1), “Downton Abbey” and not wearing the navy-blue shirt with the black pants. So when my wife told me last year I should be watching “Vikings,” well, who was I to argue? I binge-watched the first two seasons to catch up, then was thrilled each week by Season 3’s scheming shenanigans and the badass, violent exploits of Norse heroes like King Ragnar Lothbrok and his ruthless and well-muscled brother Rollo (this guy goes shirtless more often than Zac Efron). Now, Season 4 of “Vikings” is the only show I actually make sure I watch when it airs — Thursday nights, on History. You should, too. Sure, the creators play around with historical accuracy and timelines, and create composite characters. But this is a TV show, not a documentary, and it’s impossible not to get sucked into the magical, mystical drama and the well-drawn characters. You want strong women? There’s Rollo’s spunky Parisian wife, Princess Gisla, who thinks her dad, the Emperor Charles of Frankia, is a big wuss. Oh, she also put a knife to Rollo’s throat on their wedding night. My favorite is Ragnar’s ex-wife Lagertha, who this season alone has castrated the dastardly Einar as he was dying and killed her lover Kalf. On their wedding day. After telling him she was pregnant with his child. That’s Some Serious Viking —-. There are so many great story lines and characters it’s hard to keep up. I am amused by the clever King Ecbert of Wessex, although when he’s on screen I sometimes feel like we’ve changed the channel to a Monty Python movie. The show is heavy on mysticism. Ragnar talks to imagined severed heads and seems to have a lot of visions (which, let’s face it, can happen when you’re ingesting psychoactive substances). The monk, Athelstan, was an interesting character until he, um, lost his head. (I miss Athelstan, but on this show, unlike “Game of Thrones,” it’s the bad guys who do most of the suffering and dying). The wanderer Harbard might be a god. Or maybe he’s just a drifter. He seems to show up a lot when the men are away doing manly things, free to walk around the village kissing all the women, which they seem to enjoy. The first half of Season 4 ends April 21. Enjoy these episodes if you can. If you haven’t seen this show yet, my advice is to catch up so you’re ready when “Vikings” comes back from hiatus for the second half of Season 4. Meanwhile, I’ll return to my Thursday evening routine for a while: rereading my Inspector Rebus books, snacking on dark chocolate and applying peppermint foot lotion. You know, Some Serious Viking —-.